Double Red Ripe Tomatoes, originally uploaded by Wayan Vota. I wanted to give an update to PoP readers who might be wondering how my garden is coming along after the Great Lettuce Harvest. 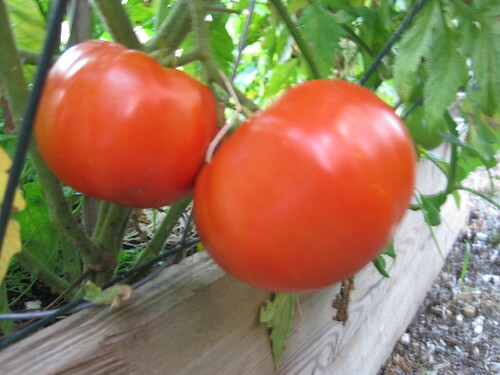 First off, as you can see, my tomatoes are already coming in, and I’ll be having a bumper crop this year. While they were too late to go with the lettuce, I also have crazy numbers of cucumbers already ripe for a tom/cuke salad. Now I do have a question for PoP readers: what do I do with my banana & jalepeno peppers? I ask because my wife does not like thinks hot and spicy, though I do. So is there a dish that I can make with these that will satisfy us both? I hope all the other urban gardeners are just as lucky.